Advertising is a crucial element of the success of any business because it motivates and engages potential customers. One of the best ways to impact new customers and revive former customers is via printed outdoor banners. Marketers may be deterred by the issues involved in outdoor advertising, but benefits far outweigh potential disadvantages. Since decades, outdoor banners have been utilized in both national and local campaigns across the country. They are very popular, staying inexpensive and successful over the years. Outdoor banners stand apart from a store with colorful and bold content, which catches the eye of those passing by, including potential customers. A repeat customer is also reminded about the store and its products when they pass by outdoor banners. High-resolution displays have a powerful impact on attracting customers to the store. It is easier to print and set up an outdoor banner compared to professional installation of monument sign or Pylon sign. When clients wish to advertise in a temporary event like a fair or exhibition, they may need something which can be installed, fabricated and designed very fast. In case, you don’t have the talent to do it yourself; take the help of professionals at banner sign company Naperville IL. When outdoor banners are created in vinyl or mesh material, one can expect an outdoor banner to last nearly 5 years before starting to fade. They can brave exposure to sun, moisture and harsh winds for extended periods of time. UV rays are the primary cause of damage and fading. Suspending a banner above a building, parking lot or street is not rocket science. Most banners have pre-installed pole pockets or grommets, so you can set up your outdoor banner in any way you like. Marketers of today are aware of the high cost of buying space on digital media and social media management. While these are highly effective strategies, creating outdoor banners can support such advertising. In fact, outdoor banner advertising costs only a third of the cost for PPC campaigns. Outdoor banners incur one-off costs and can last for multiple campaigns, enabling brand promotion for many months and years. When repeat customers view your banner again on the retail stand at a trade show or exhibition, it helps in re-enforcement of the brand without being pushy. Even when the store is shut down after the day, the outdoor banner will continue to deliver your message. There are limited chances for telling your local community what the nature of your business is. Outdoor banners are the opportunity to raise awareness about your services and products. Despite the fact that there are other forms of advertising, which can help connect with locals, few of them exist in communal spaces. This helps in engaging with your audience completely instead of individually (like television or direct mail). Whether you are hosting a fundraiser or organizing a city event, outdoor banners may be used as a mode to provide crucial information, welcome visitors and highlight a grand opening. 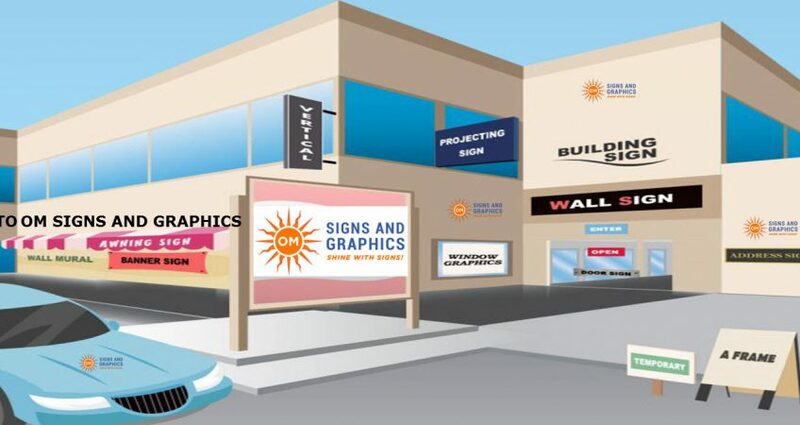 These are some of the reasons for using outdoor banners in advertising.And it might get a bit difficult for you to zero in on the right banner sign company, but, with OM SIGNS, things get much easier. Whatever your business deals in, you can contact them for the expert guidance.